Alchemilla mollis or ‘Lady’s Mantle’ is a great ground cover plant and a favourite for beneath roses. Forming a thick mat with soft green pleated foliage followed by light green to yellow flowers rising above in early summer. One of the beauties of this plant is in the morning when the foliage glistens as fine hairs on the it hold droplets of dew. Makes a nice low growing edging plant at the front of the garden border, or allow it to ‘clump up’ in a cottage garden or use in the rock garden. 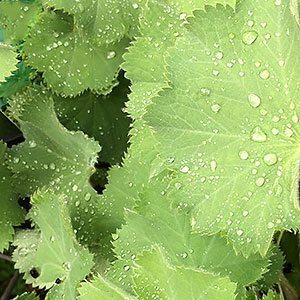 A spreading plant that forms a clump, Alchemilla mollis will reach 30cm or higher depending on conditions and grows well in a humus rich moist soil in sun to semi shade. It does require good drainage but needs a little water during hot summers. If deadheaded after flowering a second flush of flowers will usually follow. Best to remove spent flower heads to prevent self seeding. It will die right back in winter in cooler areas and this is a good time to trim the clump if it is getting to big. Alchemilla erythropoda – Very low growing to 15cm. Alchemilla epipsila – Low growing to 30cm with green flowers.